Drink beer; make stuff. It’s a cool new trend in the world of beer events. But this is a new one. Drink beer and make a terrarium. Schooner Brewing in Seattle is teaming up with Sound Excursions to present an opportunity for you to enjoy some beers and build a terrarium. 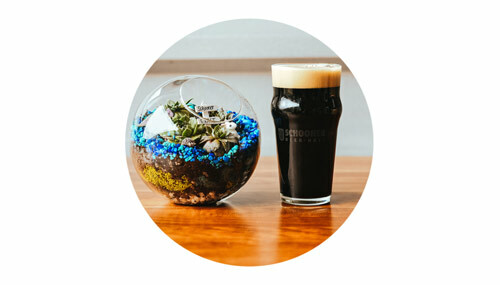 Sip some brew and build your own terrarium to take home with you. Basic details are below, but for the complete scoop about the event and to secure your tickets, visit the event website. Terrarium Making and Beer Tasting on Saturday, September 29 at 2:30 p.m. at Schooner! Get your hands dirty picking out succulents and building layers with dirt, moss, rocks, charcoal and more, all while sipping your favorite Schooner beers! We’ll meet at Schooner Exact in SoDo. Before getting settled, grab a cold brew at the bar. Sip your local beer while you select your succulents and build our layers. You’ll get your hands dirty with soil, charcoal, rocks, moss and more! Feel free to bring your own decorations to add onto your terrarium during the event.